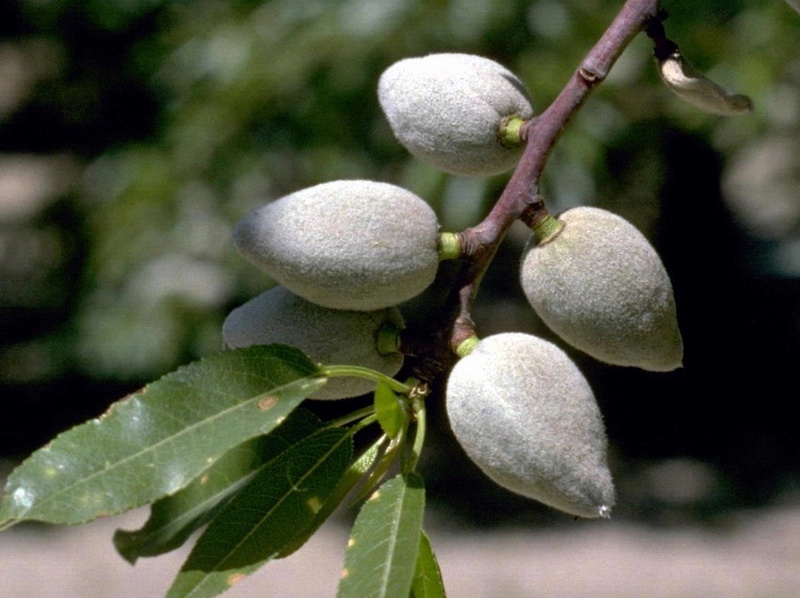 Almond is a small tree, growing to 4-9 m tall. The leaves are lanceolate, 6-12 cm long, and serrated at the edges. The flowers are white or pale pink, 3-5 cm diameter with five petals, produced in early spring before the leaves. The fruit lacks the sweet fleshy outer covering of other members of Prunus (such as the plum and peach), this being replaced by a leathery coat. The stone contains one or two edible almonds nuts. While the almond is most often eaten on its own, raw or toasted, it is used in some dishes. It, along with other nuts, is often sprinkled over desserts. Almonds can be processed into a milk substitute simply called almond milk, the nut's soft texture, mild flavour, and light colouring (when skinned) make for an efficient analog to dairy, and a soy-free choice for lactose intolerant people. Almond extract is also a popular substitute for vanilla extract among people with diabetes. It is the main ingredient of marzipan. The sweet almond itself contains practically no carbohydrates and may therefore be made into flour for cakes and biscuits for low carbohydrate diets or for patients suffering from diabetes mellitus or any other form of glycosuria. Almonds are a rich source of Vitamin E, containing 24 mg per 100 g. They are also rich in monounsaturated fat, one of the two good fats responsible for lowering LDL cholesterol. Almond tree needs a warm dry climate in order to produce well. It will survive in more temperate climates, such as that in the south of the UK although fruit production will be inferior. 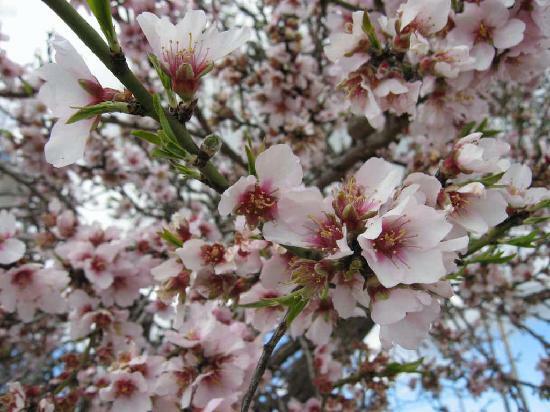 Almond tree are not self-pollinating so at least two different varieties of trees are necessary. Many almond orchards have beehives in place to assist with the pollination. Deep, loamy, well-drained soils, but will tolerate poor soils. 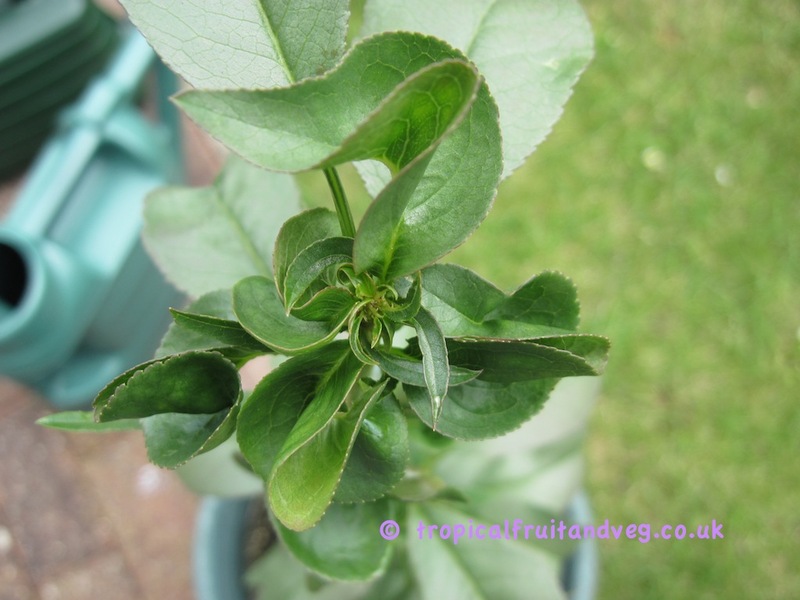 Propagation is by grafting onto almond or plum trees.